Celebrate ‘stove top’ coffee in style - the traditional method of preparing coffee in the Italian home. 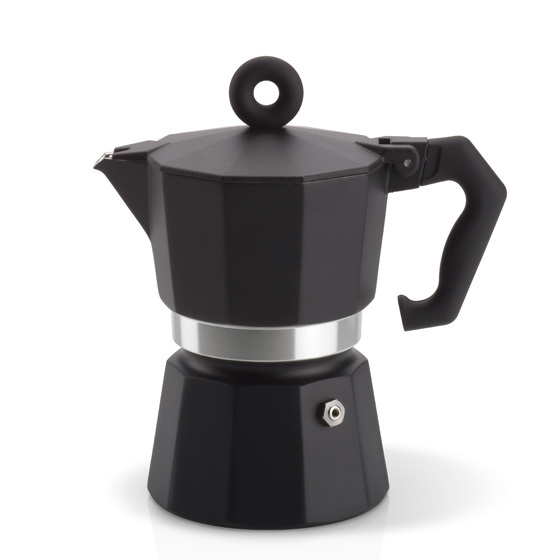 These beautiful stainless steel Moka pots are designed, produced and finished in Italy using top-quality materials such as: aluminium alloy, stainless steel internal filter offering higher heat and pressure resistance, a silicone gasket which ensures safety and durability and certified high-temperature-resistant paints and treatments. The steel filter allows the coffee to flow with less pressure and heat, improving the quality and taste of the coffee. Available in black and red. Sizes: 3-cup and 6-cup.